The wait for Super Troopers 2 isn't over, but it just got a lot shorter, because the movie is finally, officially filming outside of Boston. The road to production for the long-awaited comedy sequel has been long, confusing and difficult, but fans of the Broken Lizard comedy are finally getting the Super Troopers sequel they always wanted. Now, cameras are rolling and we will finally be seeing some footage in the near future, and more importantly, the movie at some point. News broke courtesy of the Broken Lizard Facebook page today that filming had officially started on Super Troopers 2, which for some, may be a bit confusing. The movie raised money through crowdfunding last year in order to get made, and reports had surfaced previously that the gang had already been filming, but production had to be halted. It isn't clear what was filmed during that time, but in any case, the actual movie is definitely being filmed currently. Here is what the post had to say. 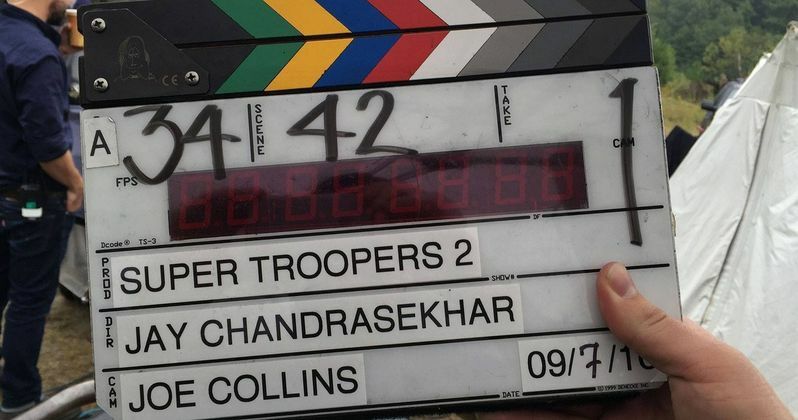 "Action, chickenf**kers: back on set and we just shot the first new scene of #SuperTroopers2"
Several movies have managed to carve a path to existence through the use of crowdfunding, but Super Troopers 2 had an especially successful campaign last year. More than $4.5 million dollars was raised by backers on Indiegogo to get the movie made, which was more than double what the Broken Lizard gang, which is comprised of Jay Chandrasekhar, Kevin Heffernan, Paul Soter, Steve Lemme and Erik Stolhanske, were hoping for when they started. That is pretty good, considering the reported production budget for the original Super Troopers was only $3 million. That movie went on to make $23 million at the box office but found a much larger audience over the years. Director Jay Chandrasekhar took to his Twitter today to also announced that the movie has indeed started filming, but that is sort of adding to the confusion. There had been reports that some sort of filming had already taken place for Super Troopers 2 as early as October of 2015. In may, Chandrasekhar appeared on an episode of Funemployment Radio, where he revealed that a test segment for the movie had been shot, and that the rest of filming would begin this fall, which it has. It is possible that the initial bit of filming we heard about was simply the test footage he spoke about. Though, as noted in a tweet below, team member Erik Stolhanske announced in October 2015 that the first day of shooting Super Troopers 2 had began, as if the actual movie was in production. Not test footage. Perhaps the movie began shooting before legal issues were cleared, and any and all previous footage had to be scrapped? Either way, Super Troopers 2 is on track now, and that is all that really matters. Related: Super Troopers 2 Is Ready for Release, When Will We See It? At the moment, we don't know a whole lot about Super Troopers 2 in terms of specific plot details, but we do know that all of the original cast is returning. Originally the movie had been slated for a release this summer, but obviously, that ship has sailed and no new release date has been set. We will surely be getting some more updates in the near future and no doubt, we will probably be learning of a new release date, likely sometime next year, soon as well.